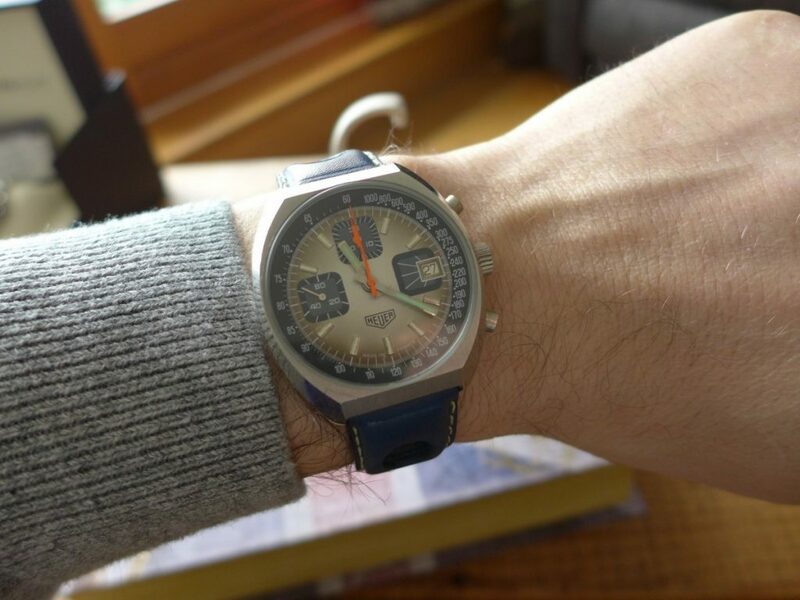 Hands on With the vintage Breitling ref 765 AVI ‘Raquel Welch’ Chronograph, the watch dates to the era early 1960’s. 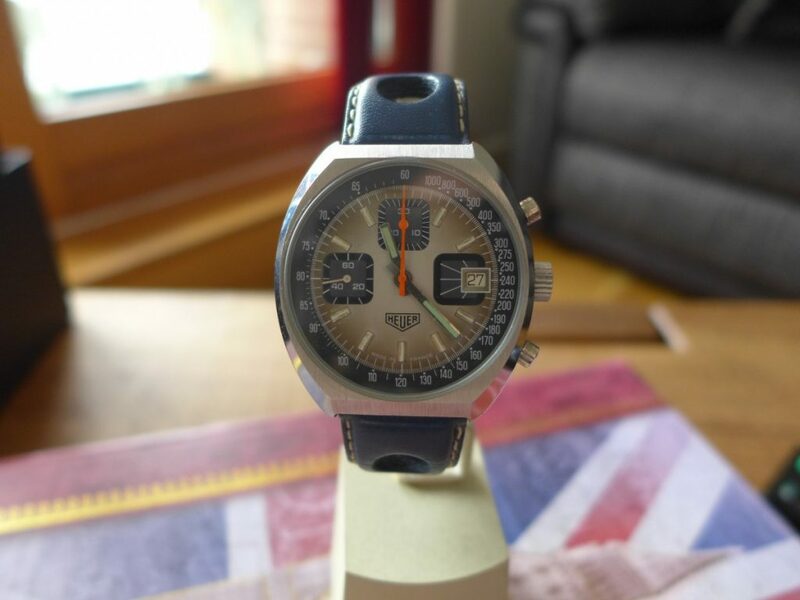 Brietling made some lovely pieces and the 765 was made from 1953 to 1978 and now are well on the collectors to buy list which are going crazy for. 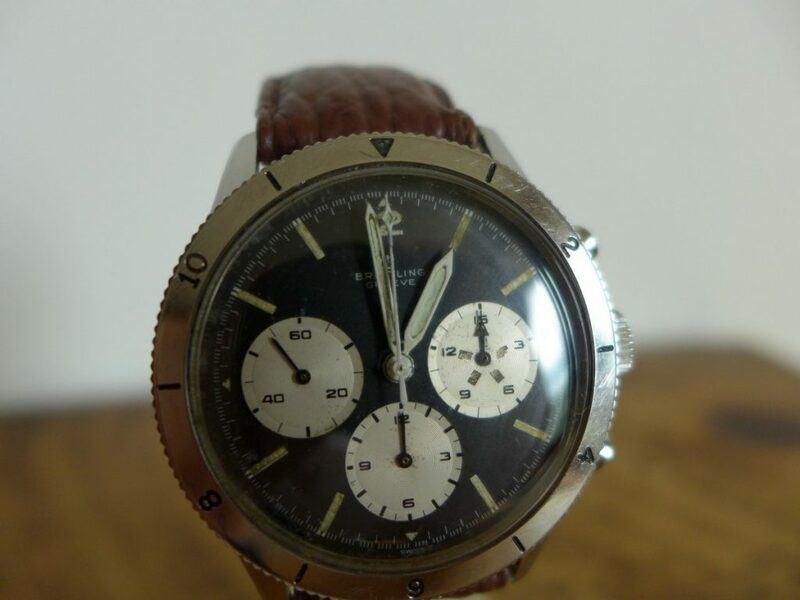 In 1953 Breitling was hoping to win the contract with french army but as the watch had no flyback function other watch brands stepped in instead. 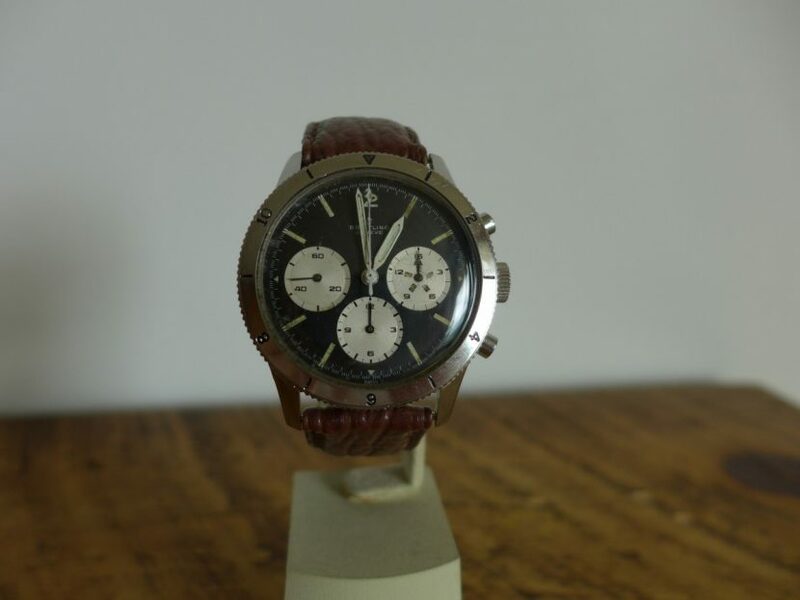 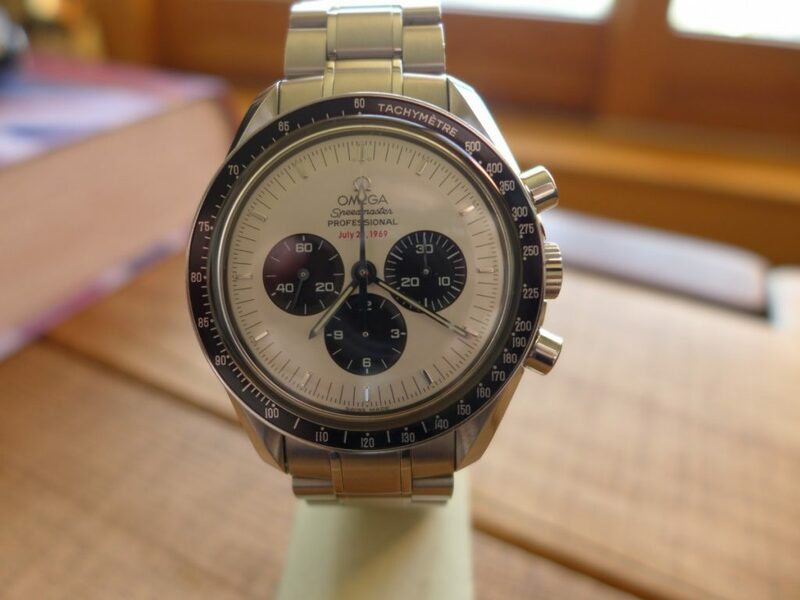 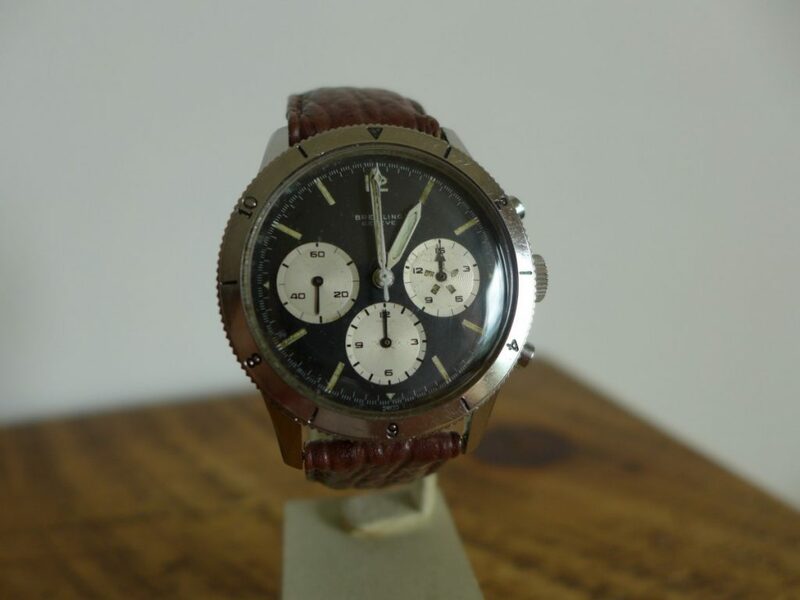 This one dates to 1962/3 and nick named “Raquel Welch” as she wore one in the movie “Fathom” and comes with the “reverse panda dial” as round that time they changed from all black to “reverse Panda dial” as they was plenty in 1962 with the all black dial. 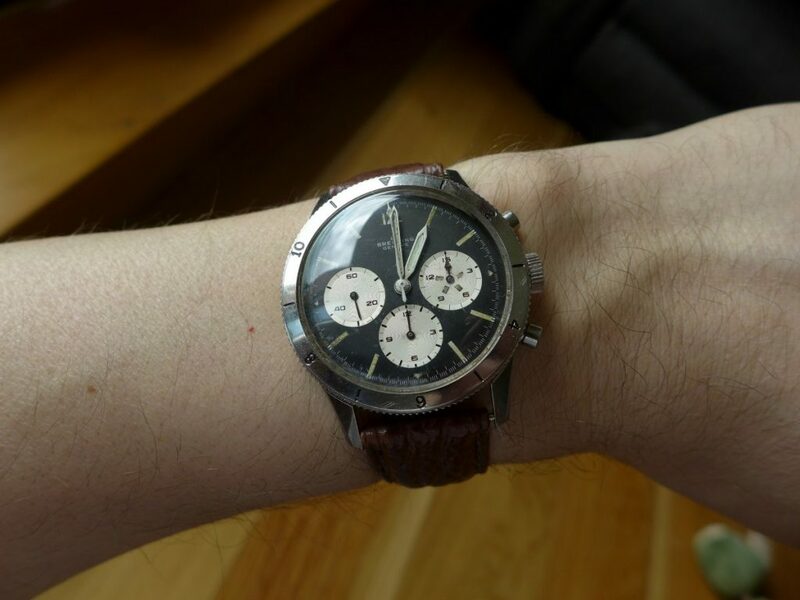 The actual term “Panda dial” means a white dial with black sub dials, hence this one is known as “reverse Panda dial” black dial with white sub dials. 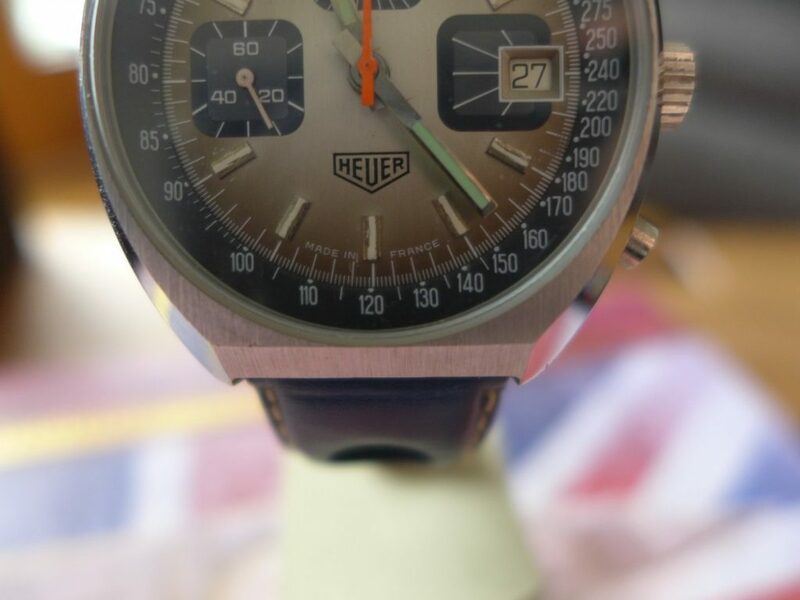 The watch was large for that time at 41mm and has stood test of time well has aged a lovely patina on the tritium markers on a matt dial. 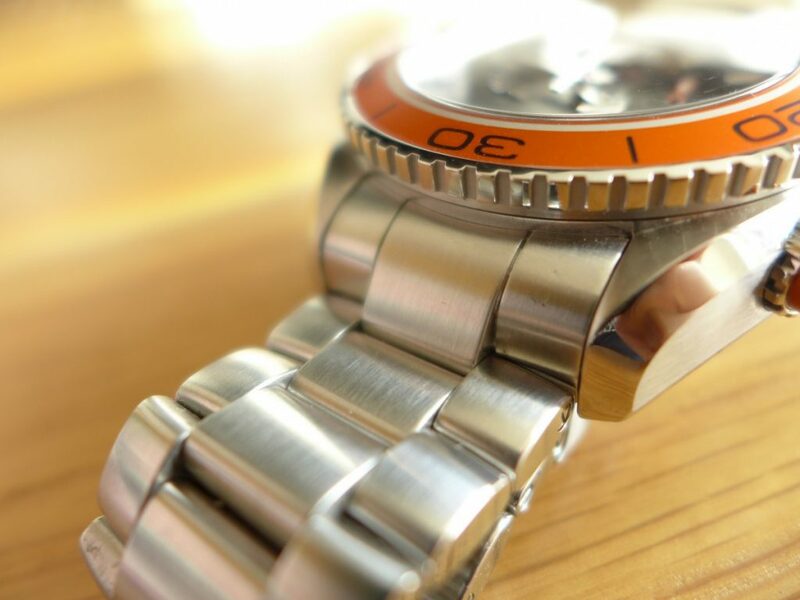 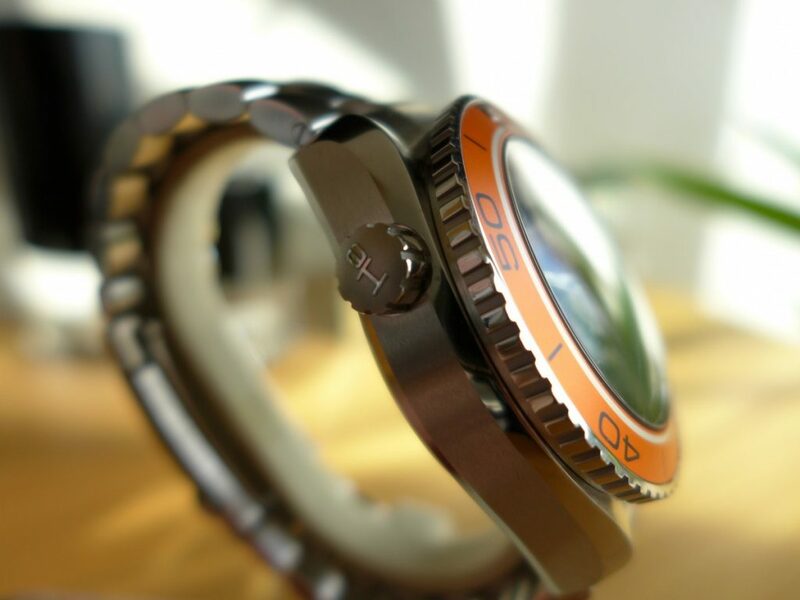 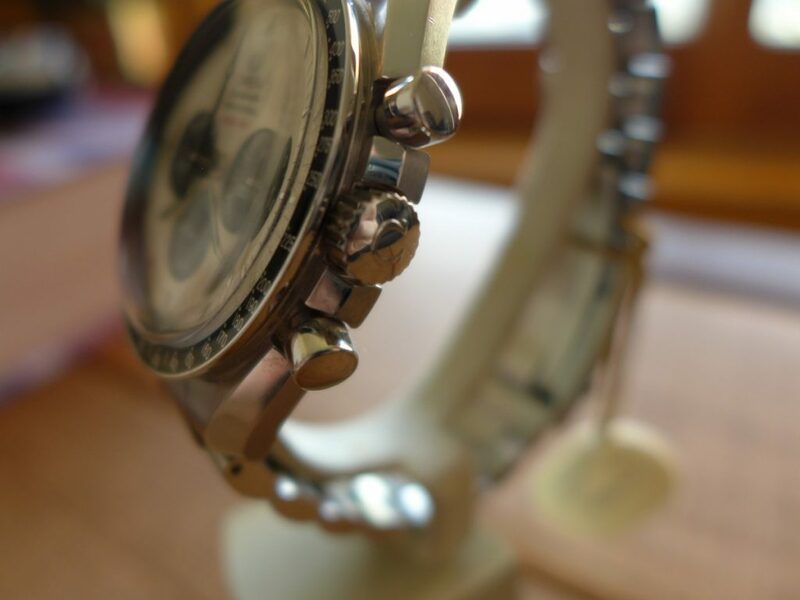 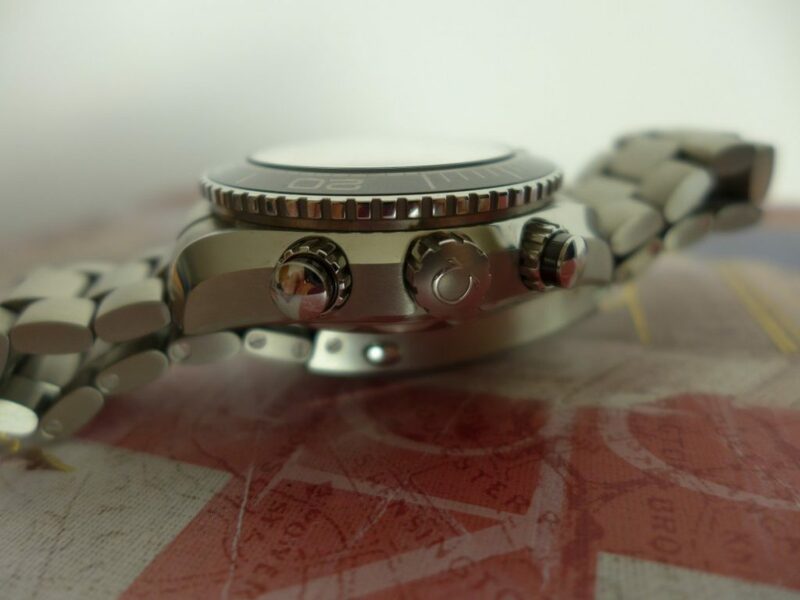 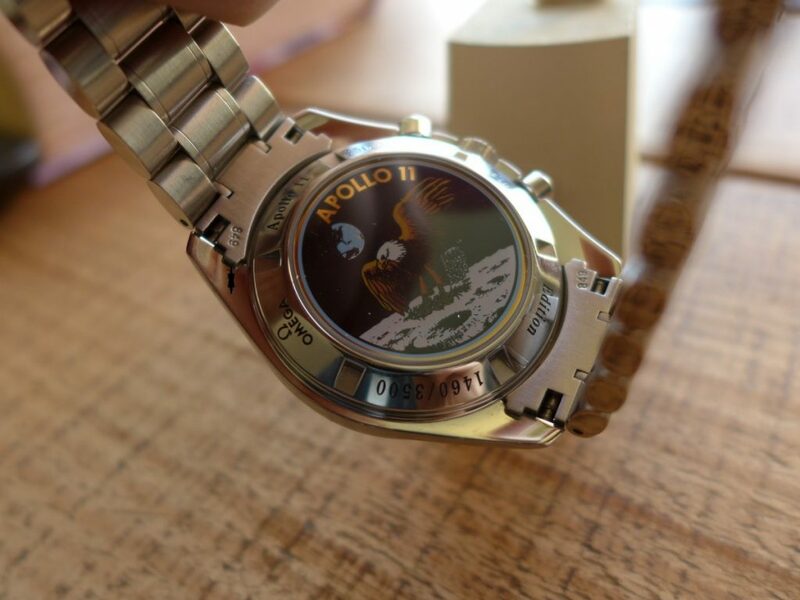 The hands are pretty big with a large hour hand with stainless steel bezel. 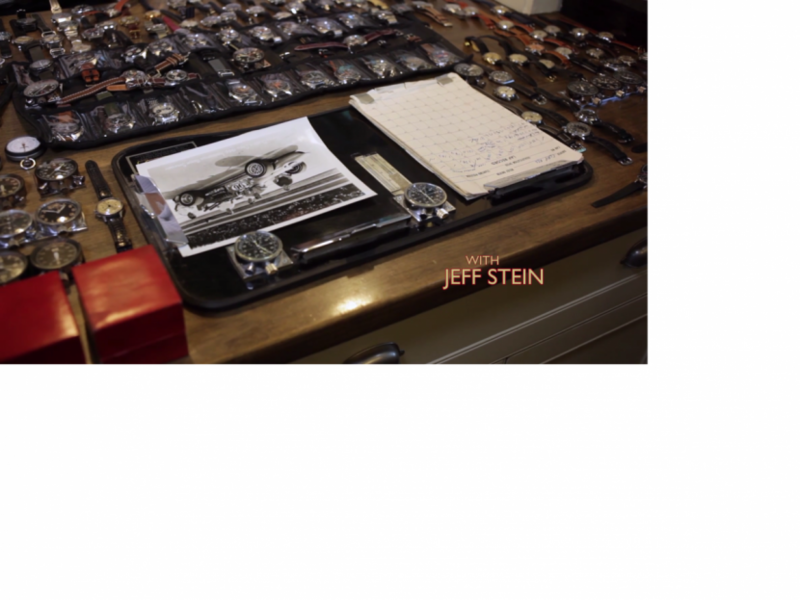 The distinctive feature on these Breitling’s is the 15 minute sub dial as most chronographs to date have a 30 minute counter. 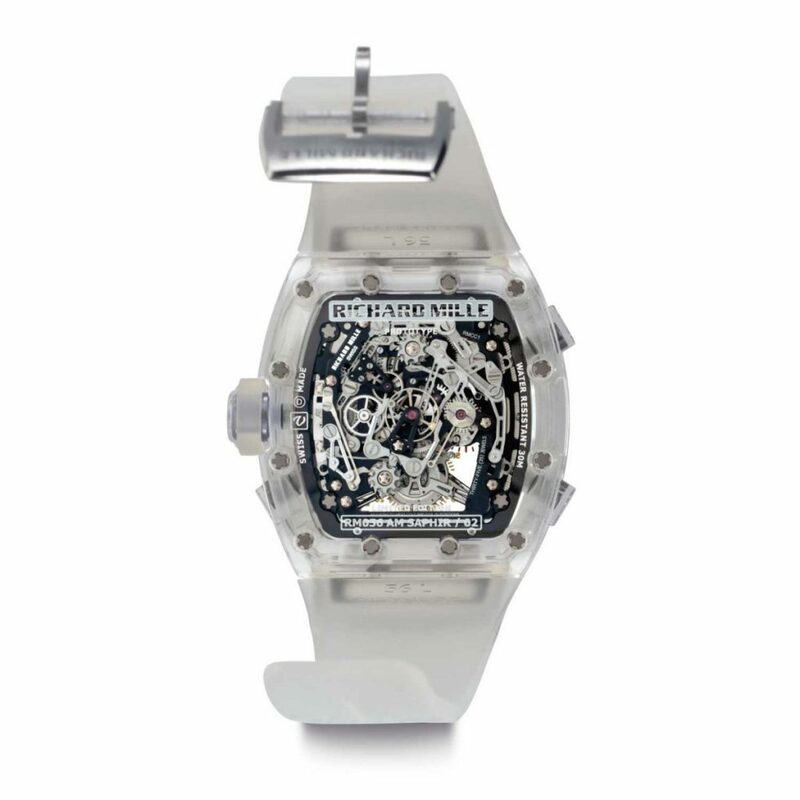 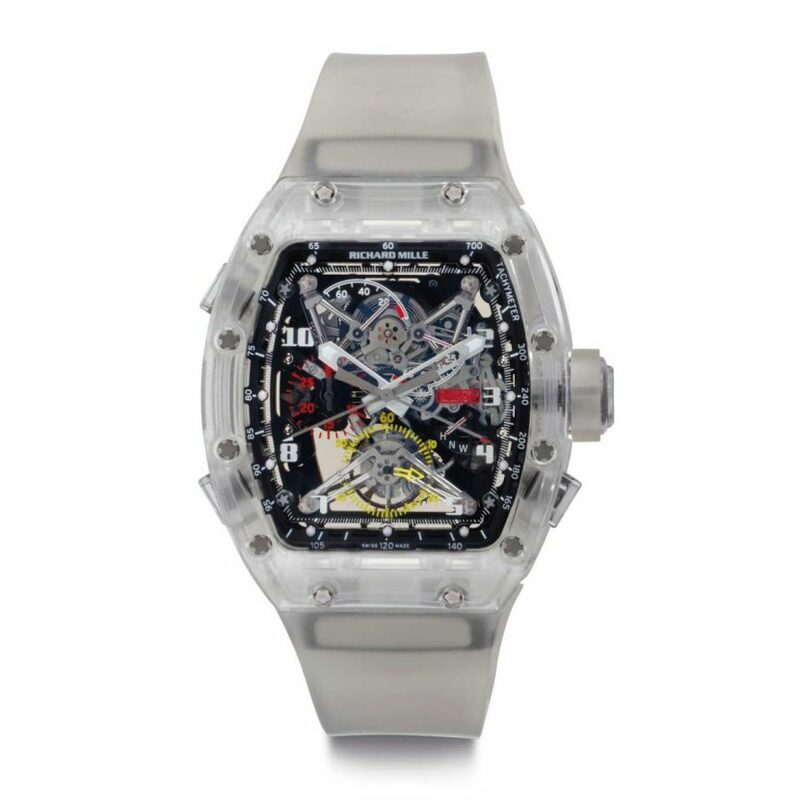 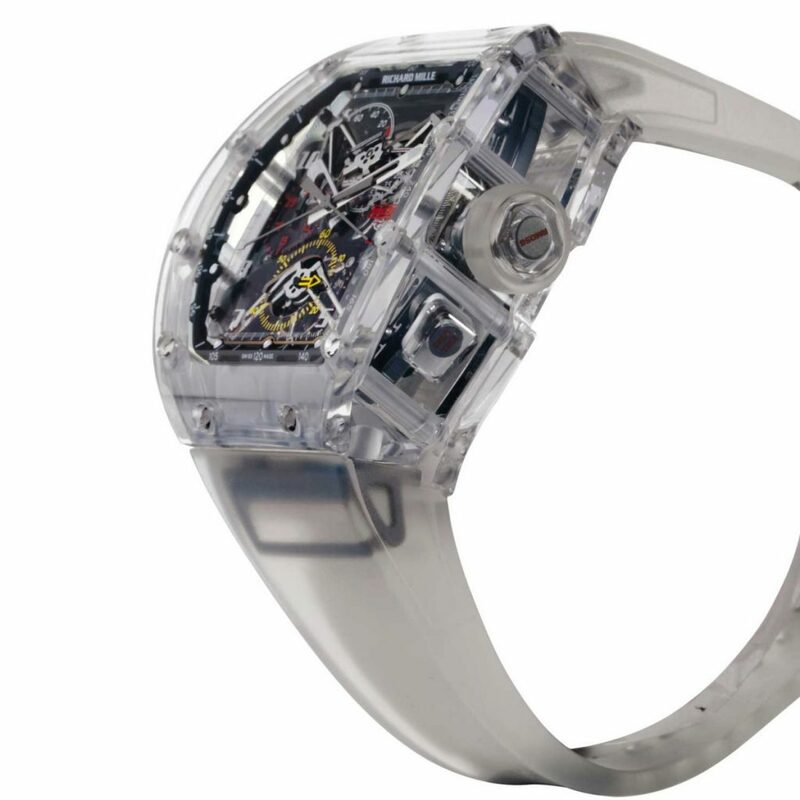 The movement is a Legendary Venus 178 chronograph movement modified to accommodate the 15 minute counter. 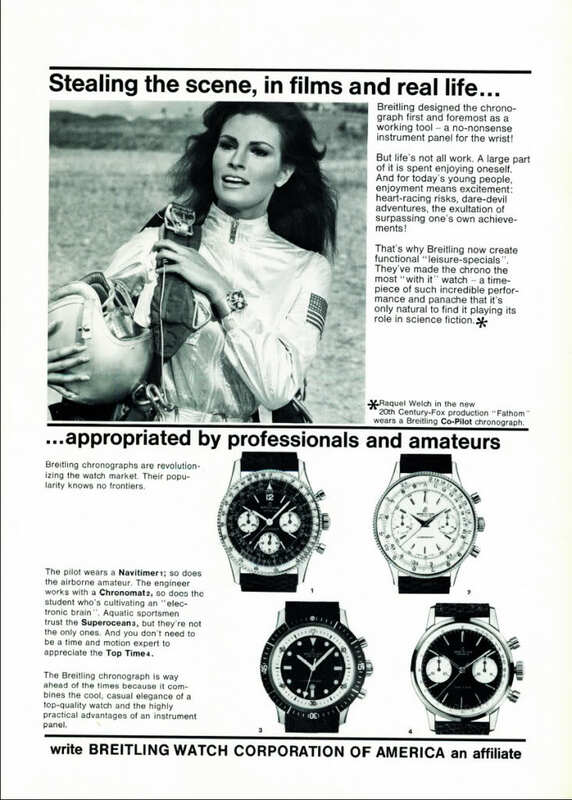 The reason Breitling had a 15 minter counter was their aviation roots knew it took 15 minutes for the pre-flight checks and also explains the unique tritium lume dash inside the sub registers to mark every 3 minutes. 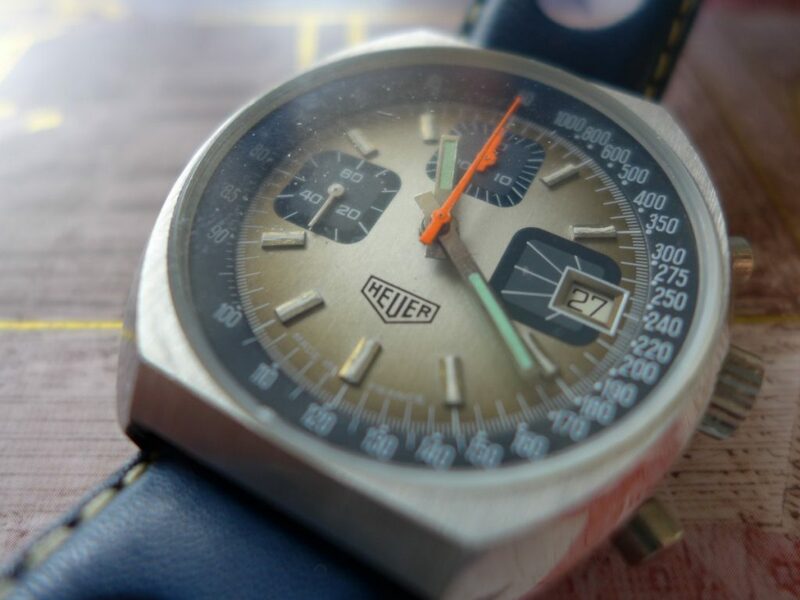 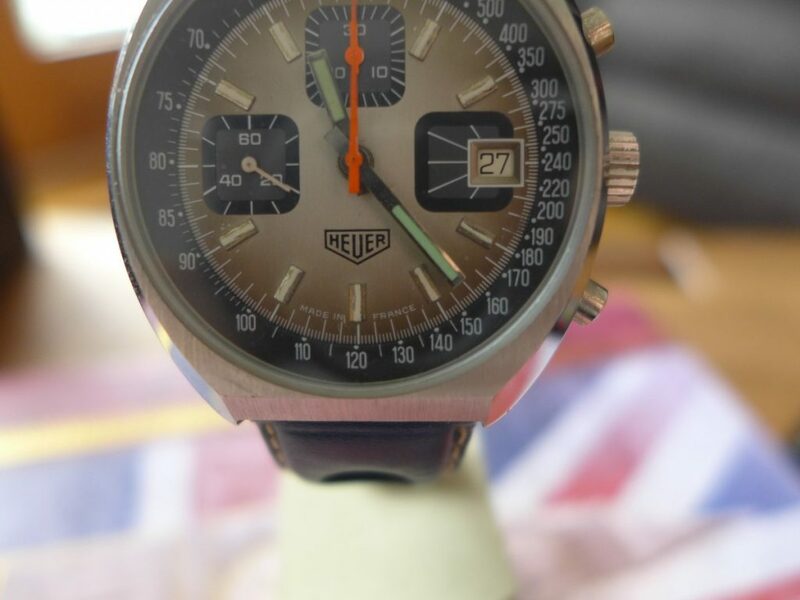 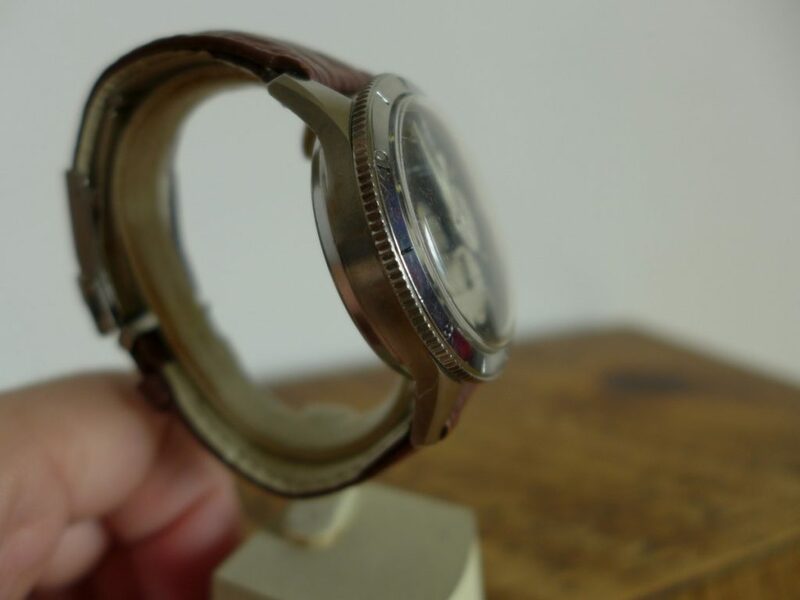 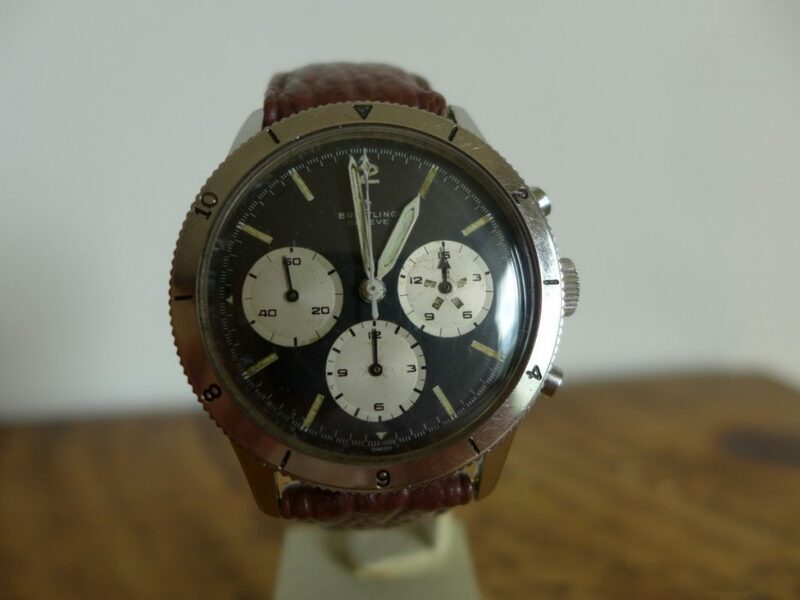 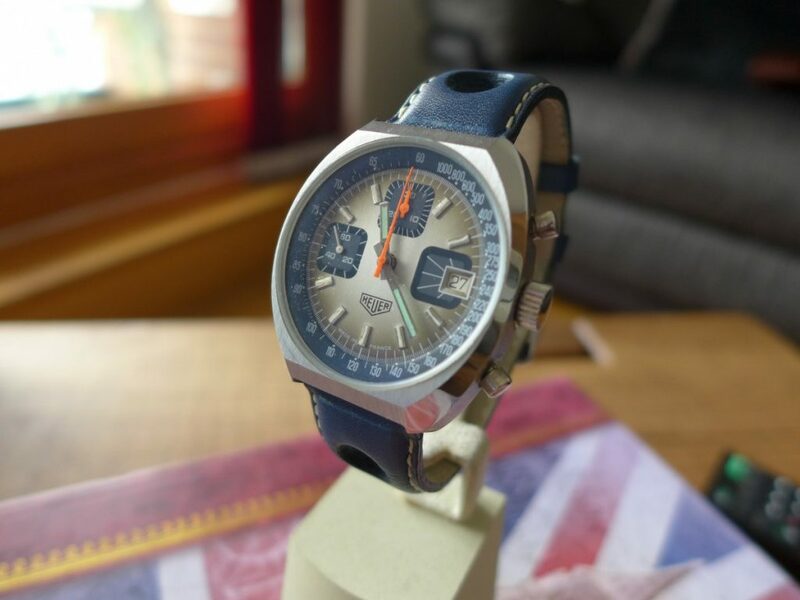 The watches where anti-shock and anti-magnetic and later on in 1965 Brietling introduced 765 Co- pilot ‘Jean-Claude Killy’ which was nick named after Jean who wore this model in 1968 Olympics. 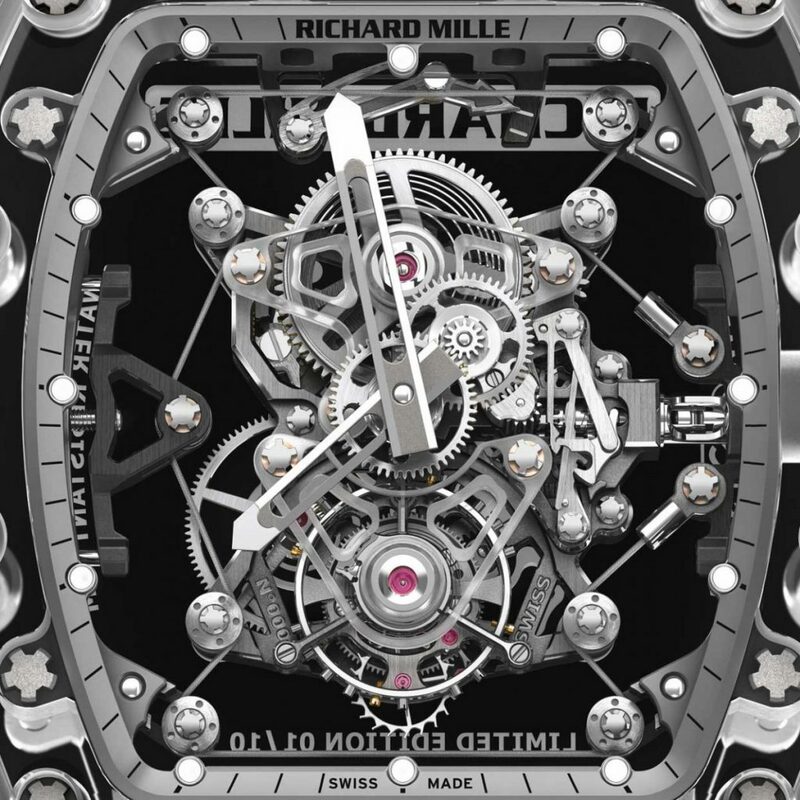 The model was updated slightly to the 765 AVI with a undated anodized black bezel instead on stainless steel and has become the one to buy. 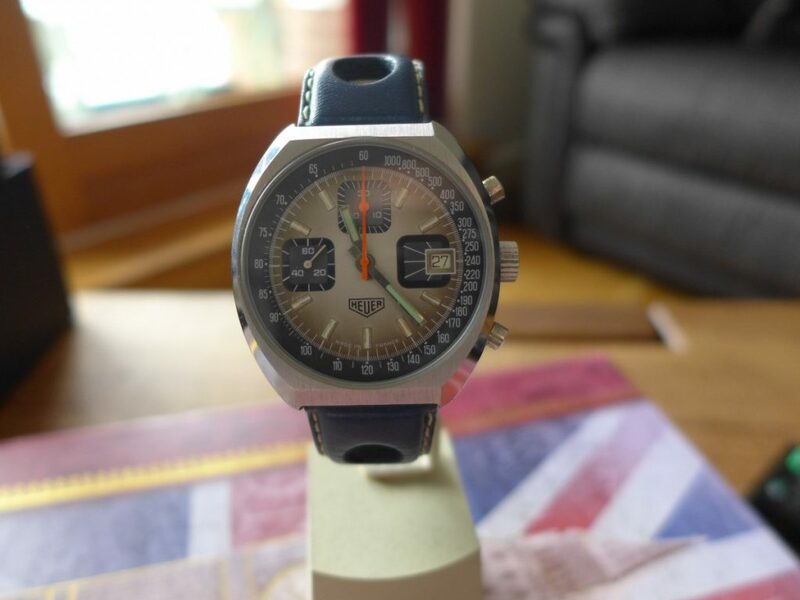 Overall all the 765 models are great vintage Breitling’s to buy in all aspects they definitely are one to watch out for in the future. 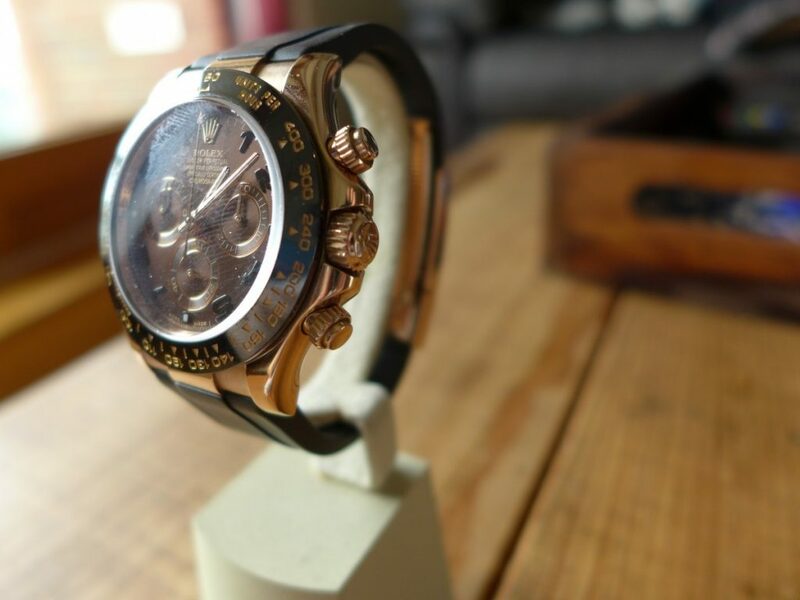 Hands On With Rolex Daytona 116515LN Rose Gold, this in my opinion is the nicest looking Gold Daytona Rolex produce not too ostentatious on a Rubber B Strap as they can look over the top with full gold oyster bracelet. 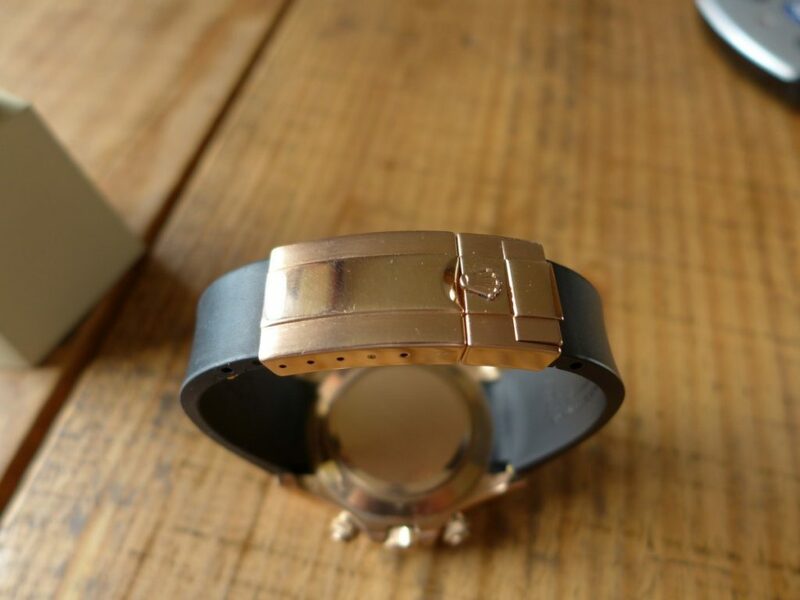 The watch original comes on a black or brown croc leather with the rose gold deployment clasp. 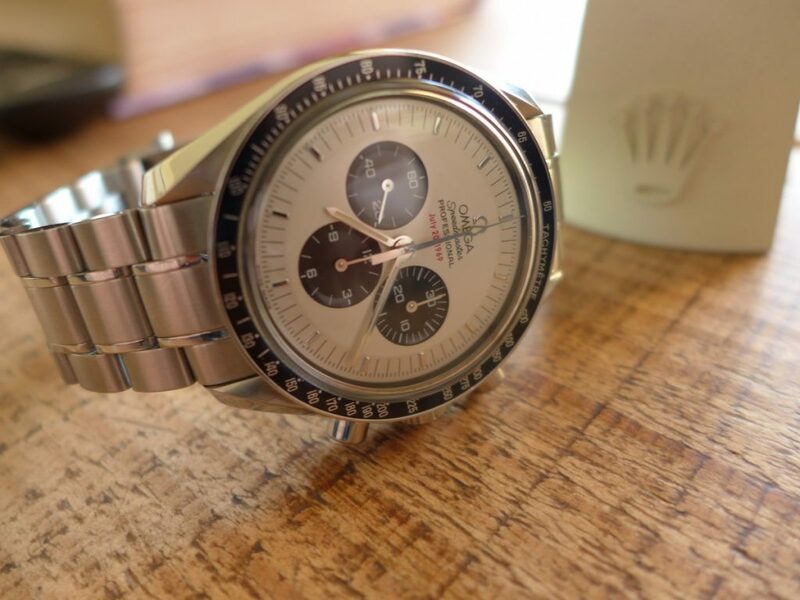 This model Daytona was probably the first of the Daytona’s to come with a ceramic bezel as I did always think why not put the ceramic bezel on the steel models? 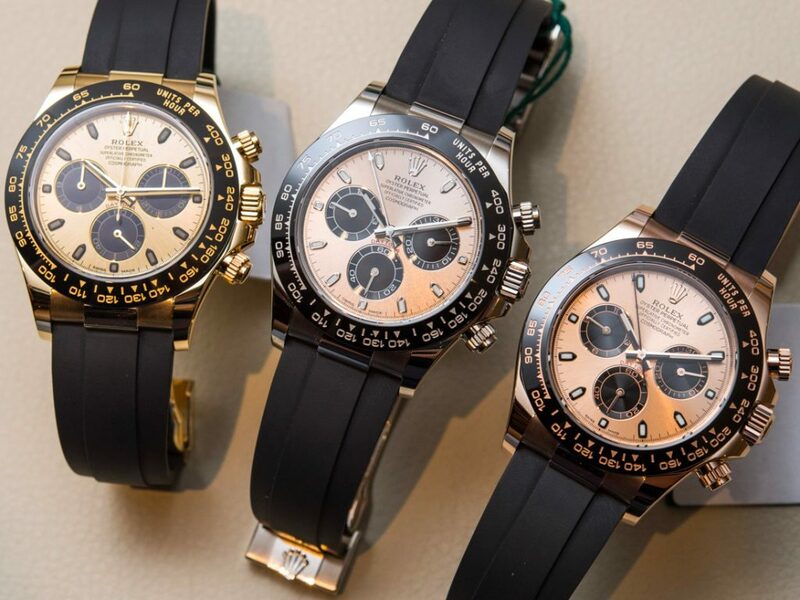 in 2016 at Basel they launched the steel Daytona with updated dial and bezel Rolex Daytona 116500LN and was an instant hit waiting lists endless…. 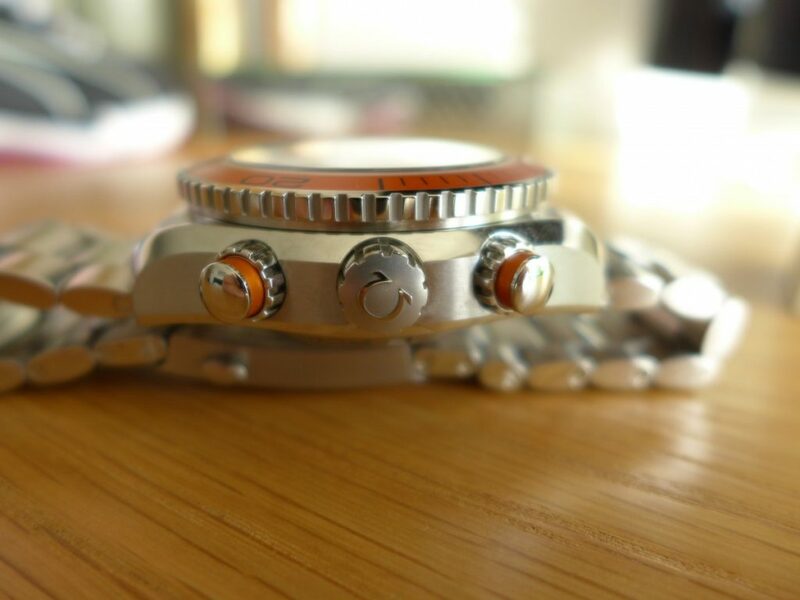 The white dial version Panda Dial always a hit white dial with black sub dials. 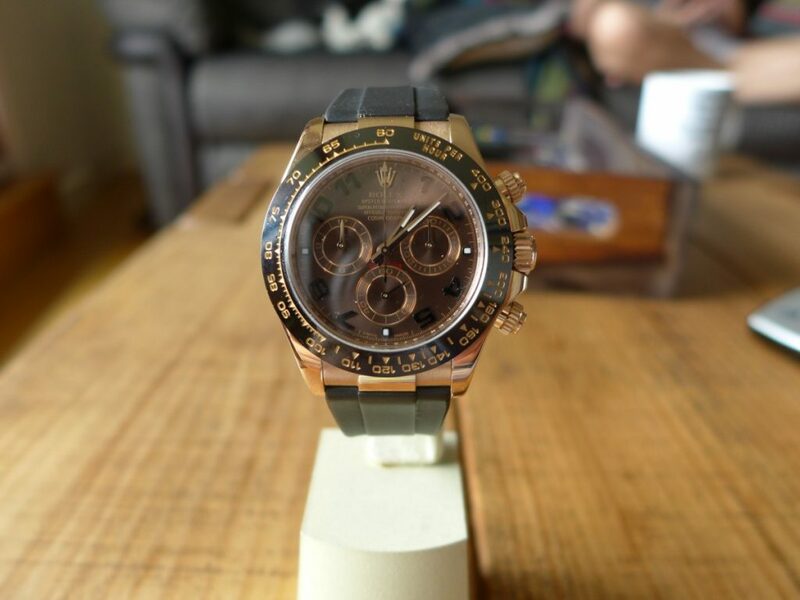 The Rose gold Daytona comes in 18K everose gold with a stunning chocolate dial with dark brown numbers not batons, black ceramic bezel with gold writing 400 kilometres or miles per hour. 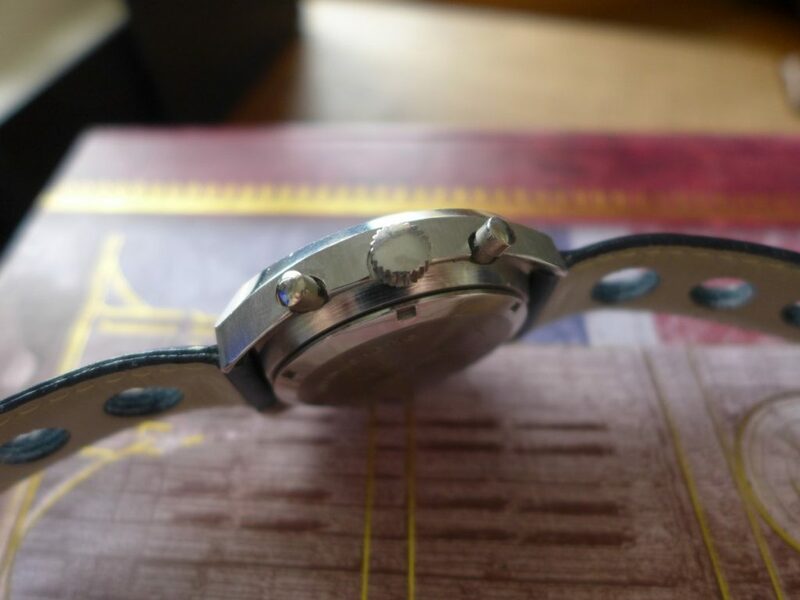 The movement is the Cal 4130 by Rolex fantastic chronograph movement features a parachrom hair spring which is Cosc rated to within 2 seconds which is another good selling point for Rolex! 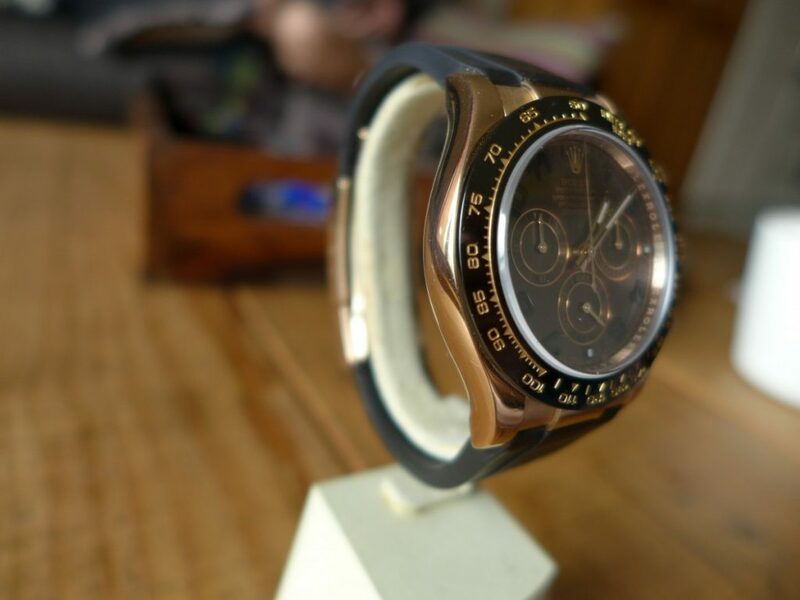 If you eyes ares not that good the chocolate dial Daytona is terrible to see the time at night but at worst I can check the time on my phone. 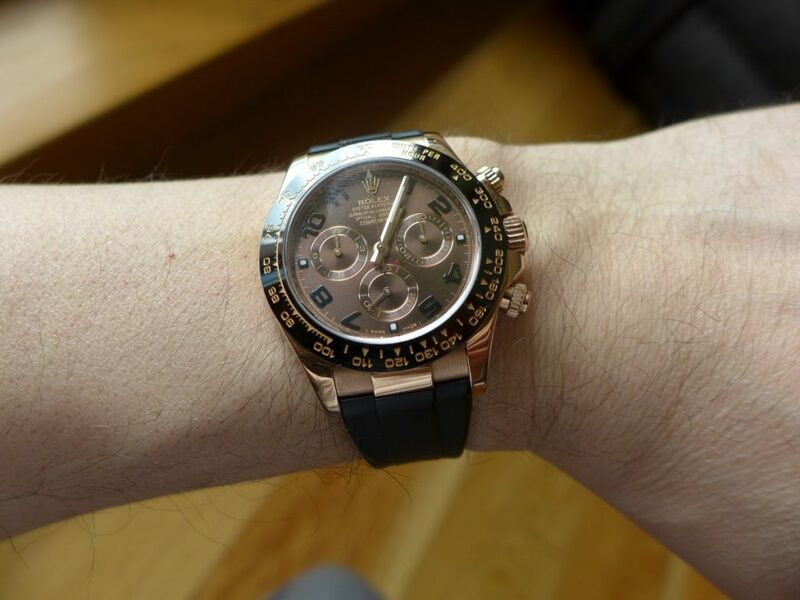 The oyster clasp looks stunning in everose gold with the rubber and this year at Basel World Rolex launched a new range to go a long side with Rolex 116515LN in a range of other precious metals 18k white gold and 18k Yellow gold on the oyster flex. 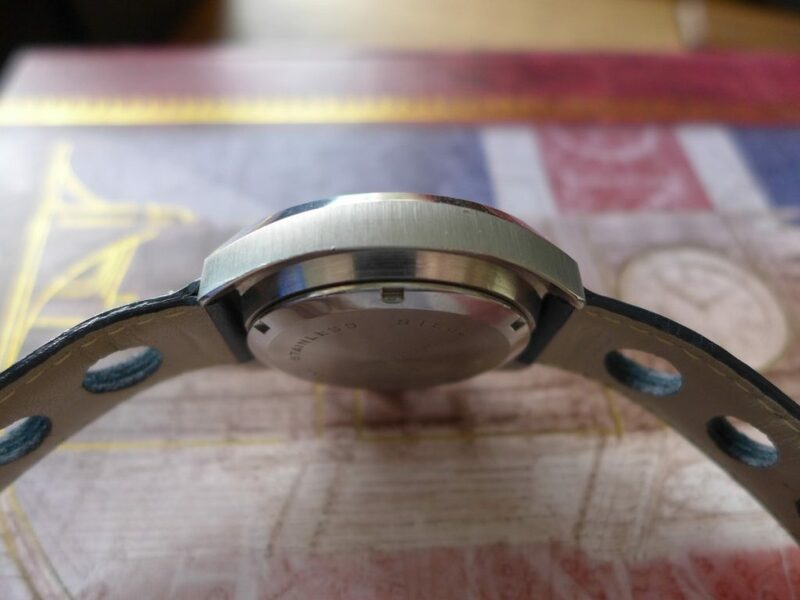 The oyster flex is Rolex’s own rubber strap which is very nice indeed although not compatible with my model as the clasp fitment is different, Thanks Rolex was hoping to buy a oyster flex strap. 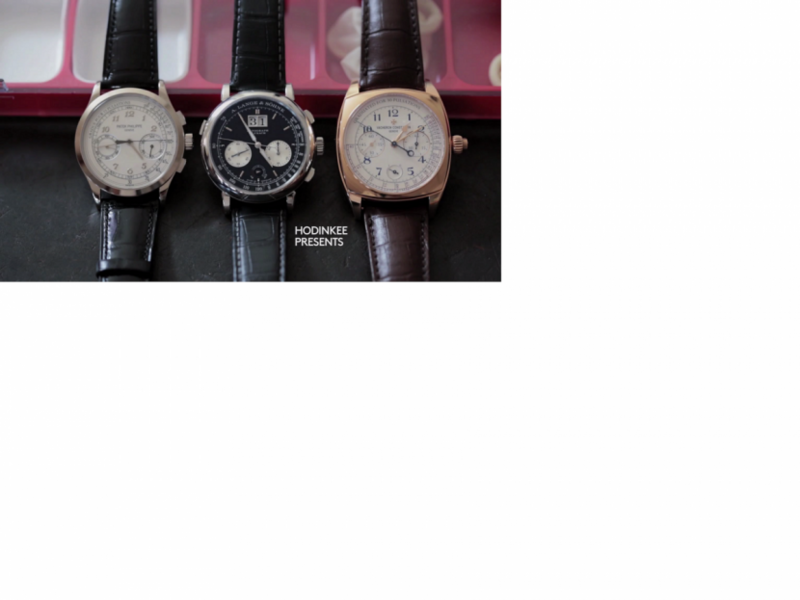 See picture below still think rose gold chocolate dial is the best looking one all thou the white gold version would be my second choice. 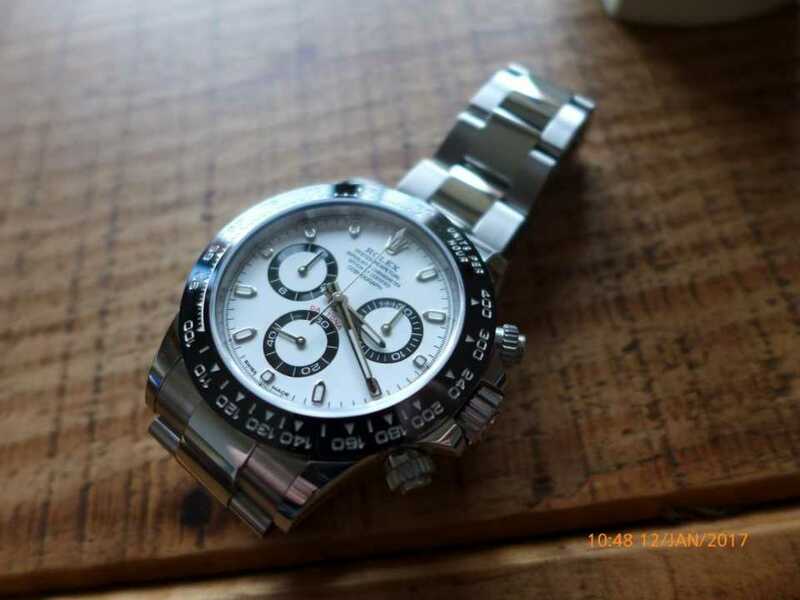 I actual think would be nice to own all 3 versions and the steel white version but how many Daytona’s does a man need!! 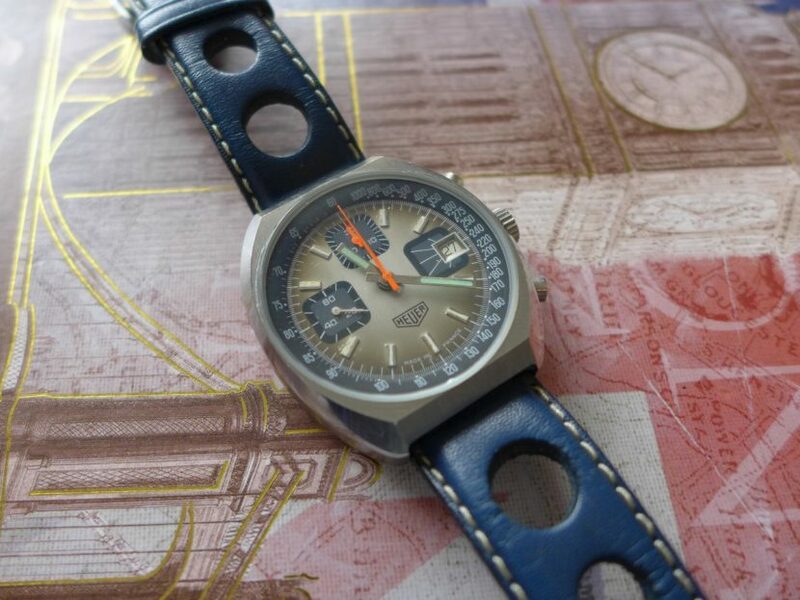 The one thing I would say is great about this model on the rubber strap is the watch can be worn every day without looking really flash and wears well in casual wear as well as smart. 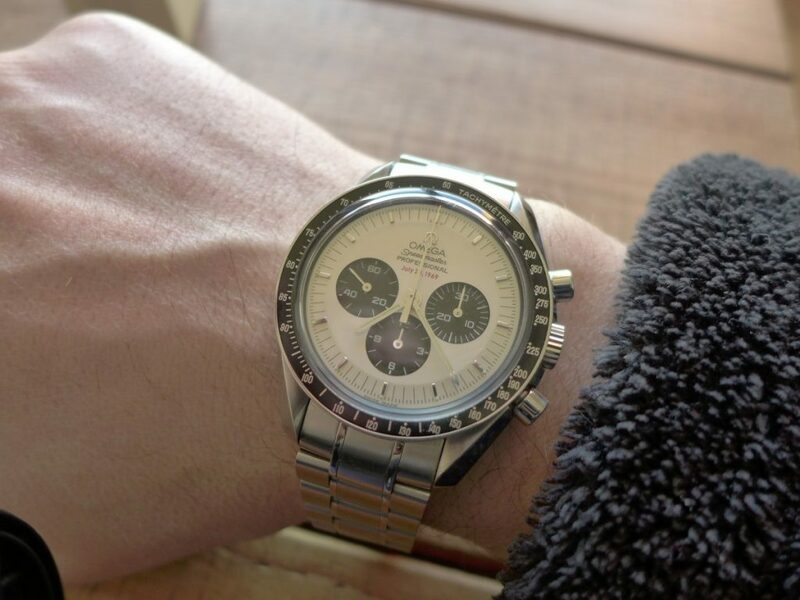 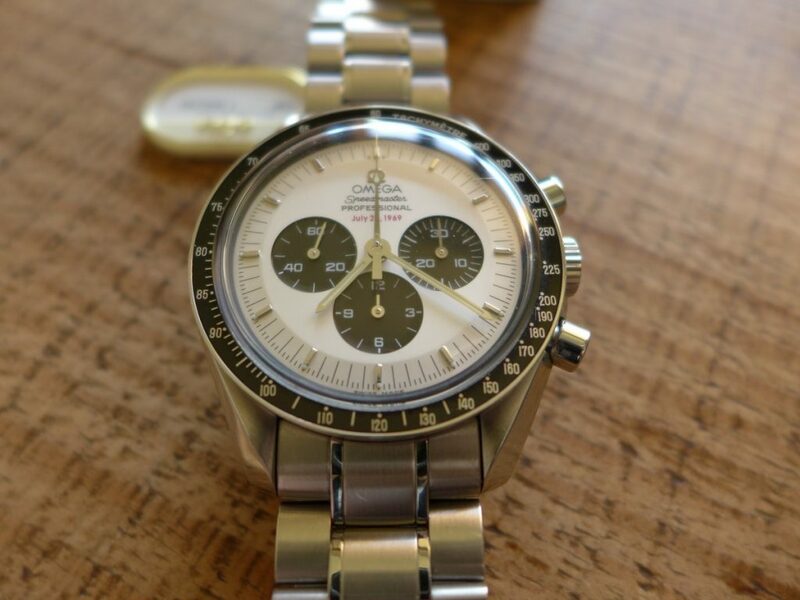 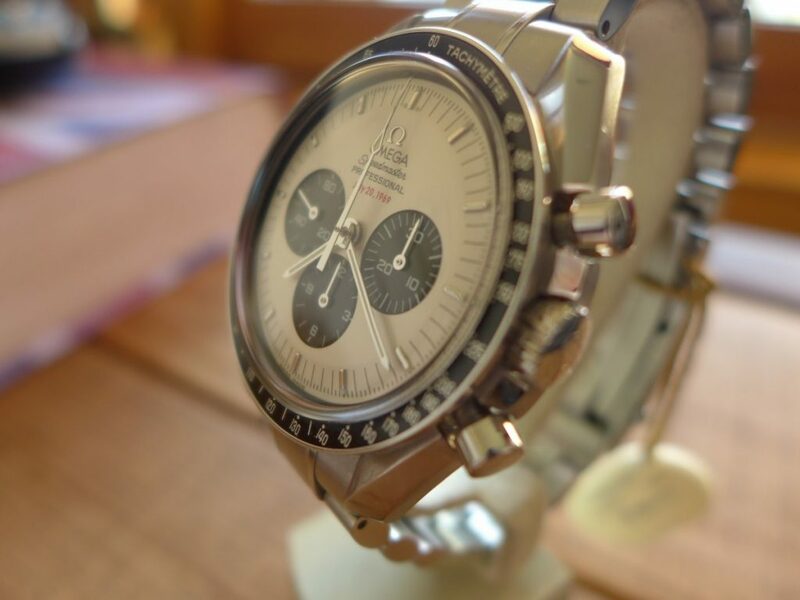 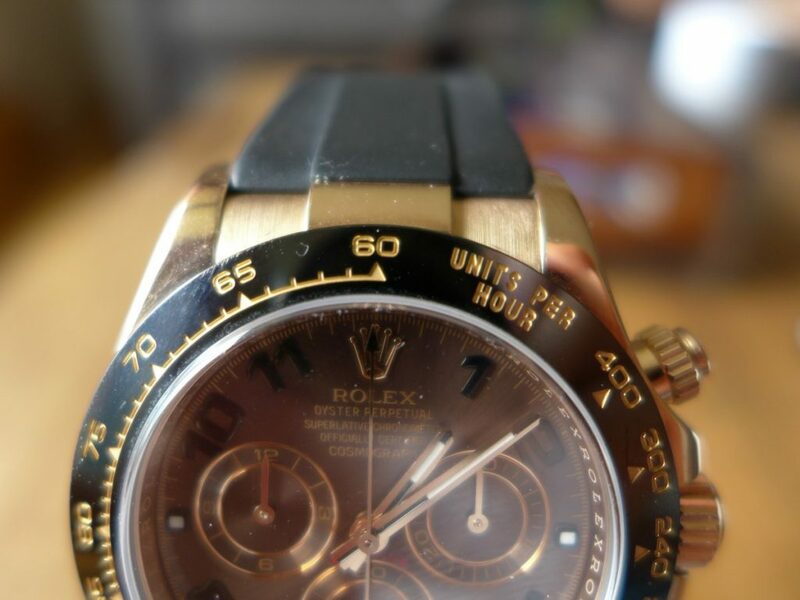 The Daytona will always be a watch to have always has been, the gold versions are not as popular due to the price tag. 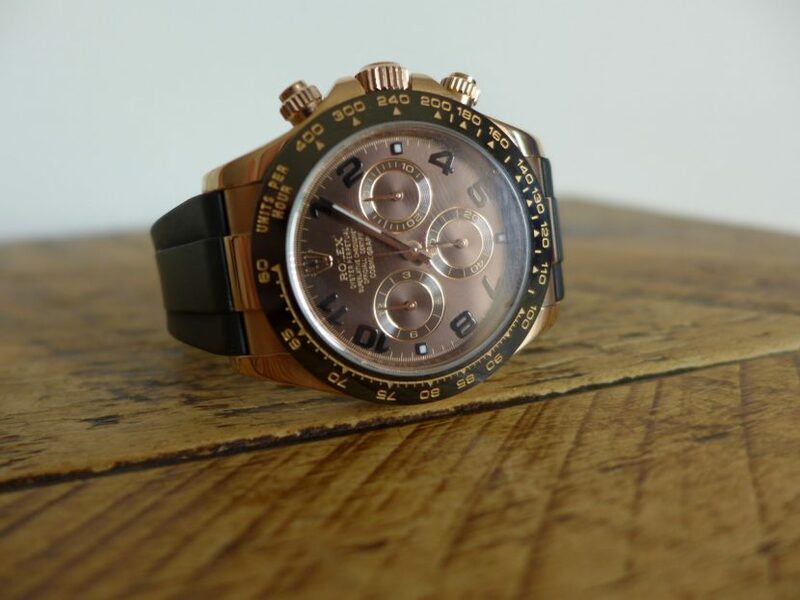 The Steel Daytona in the shops excluding Rolex Authorized Dealers are fetching some where £14000 – £15000 so the precious models are not a great deal more also can be discounted so might worth a look at an used gold Daytona on leather strap if your thinking of the steel version. 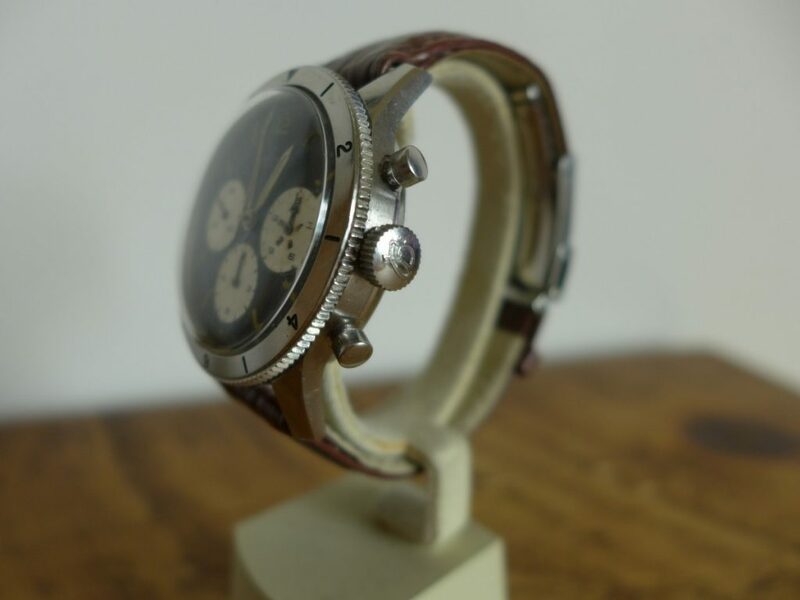 Talking Watches With Ahmed Rahman In London, as the title says always like these little videos by Hodinkee, The watches are some of the best in today standards. 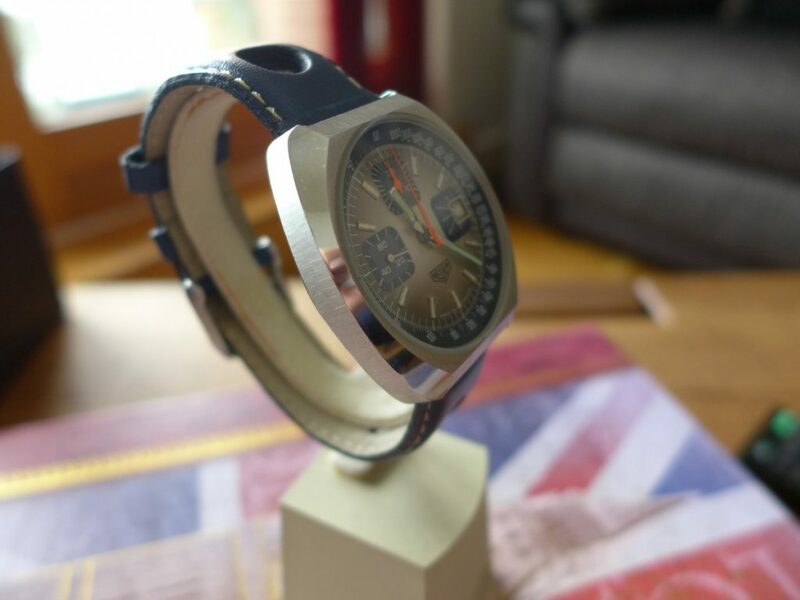 Patek Philippe, Jlc, Rolex Daytona Paul Newman, Richard Mille a new comer to the watch game but very expensive pieces designed for F1 racing no surprise there expensive everything usually is to do with racing!! 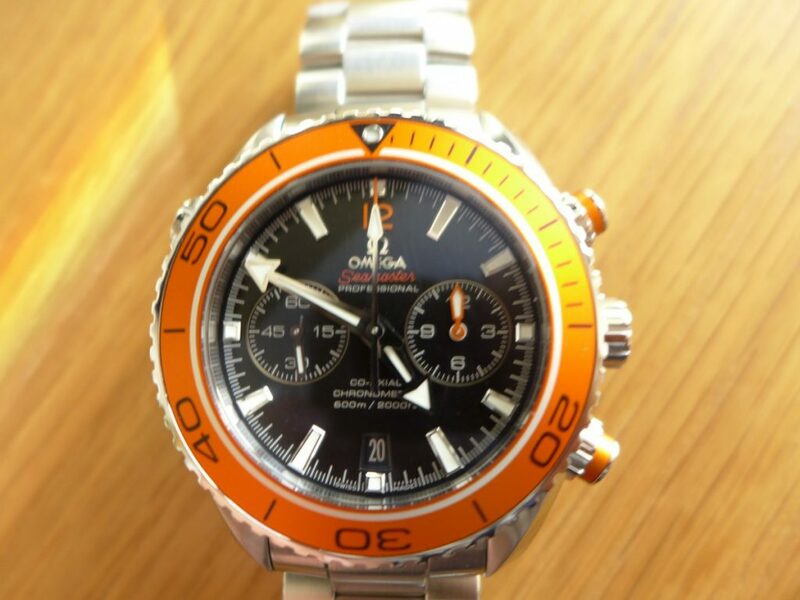 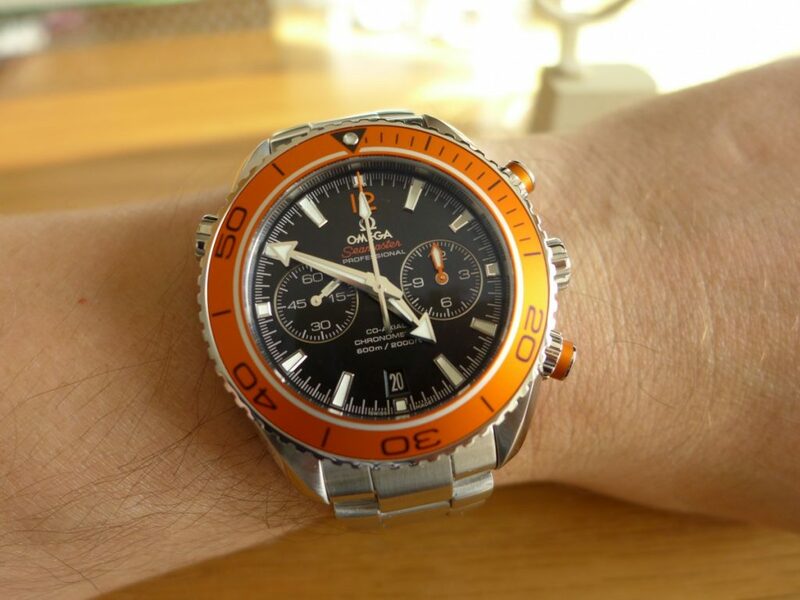 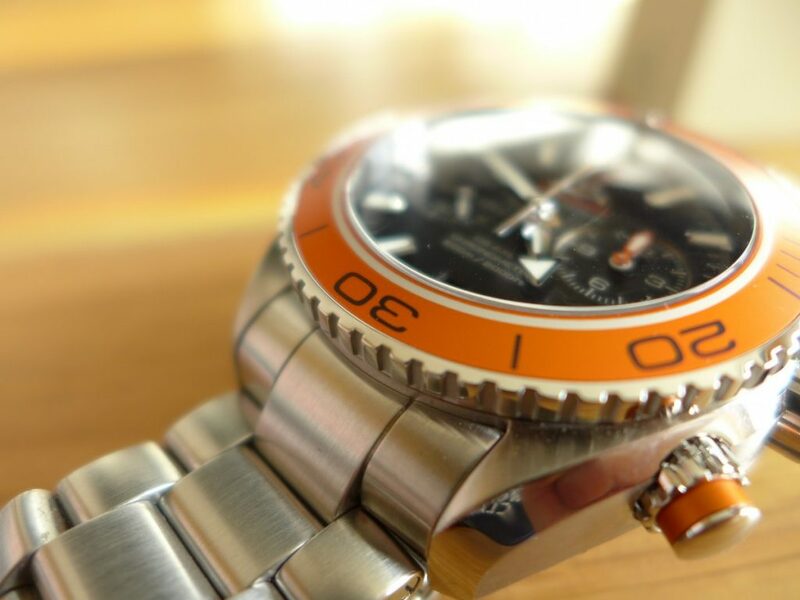 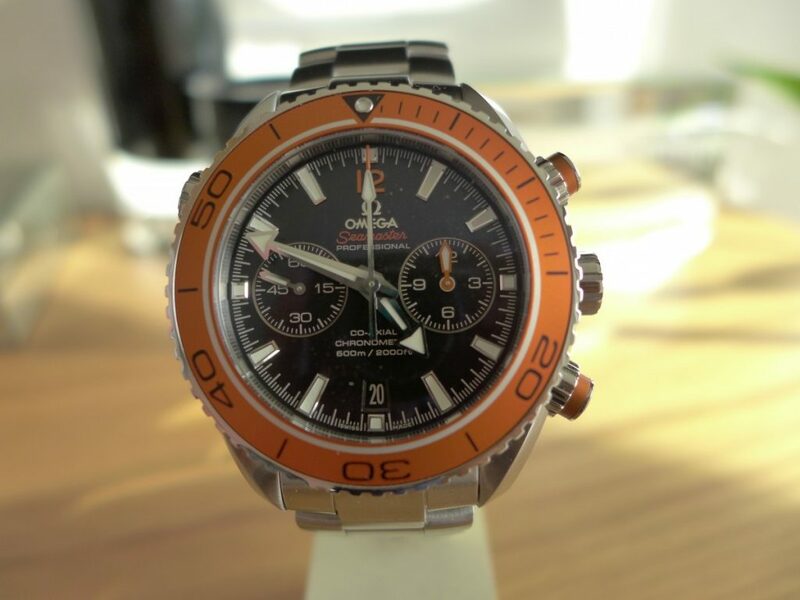 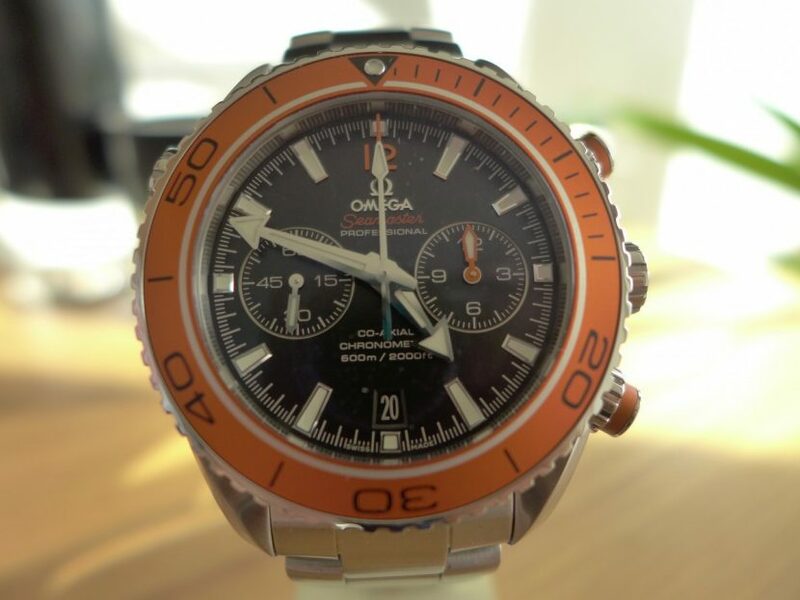 As I previously posted about the Omega Planet Ocean non chronograph version 42mm, thought it made sense to follow with reference to the “big Brother” 45mm Chronograph 600m with orange bezel. 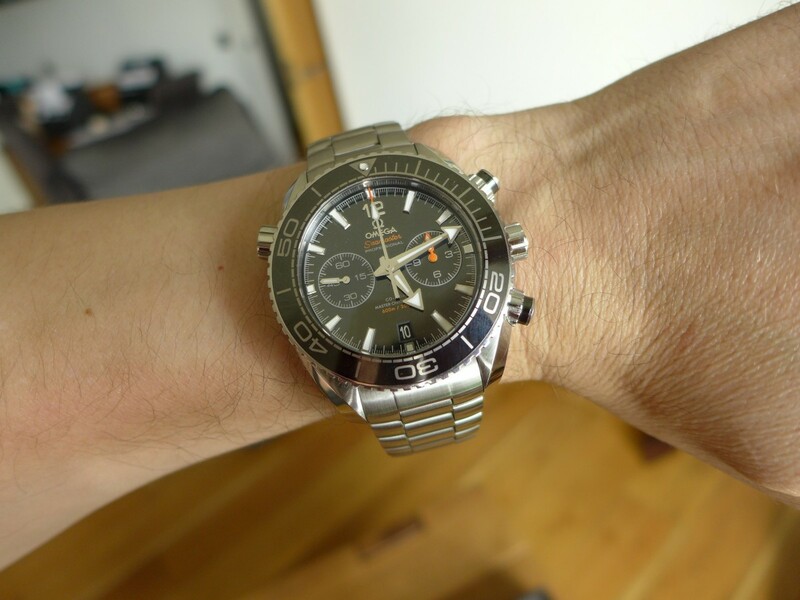 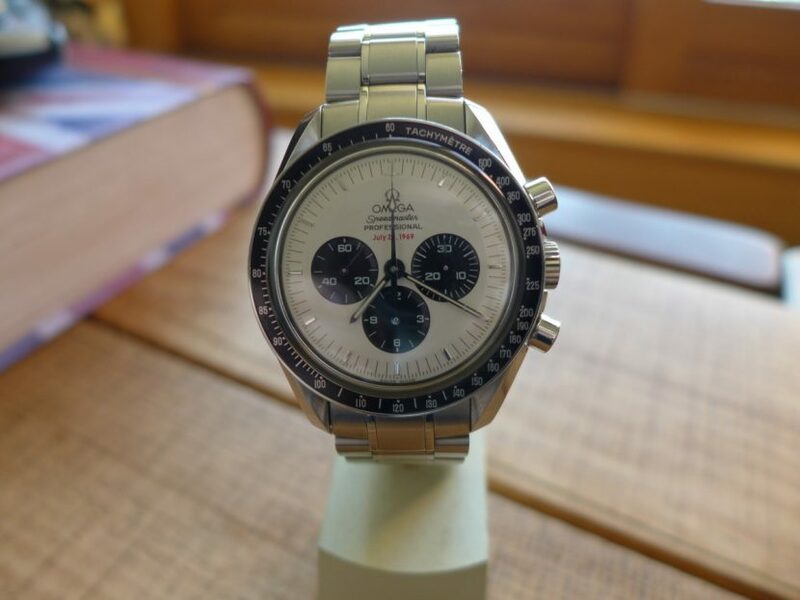 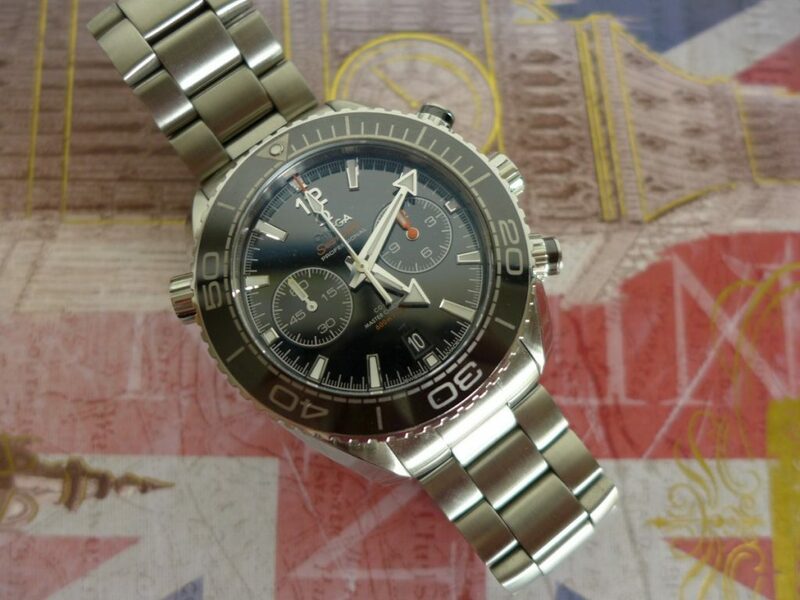 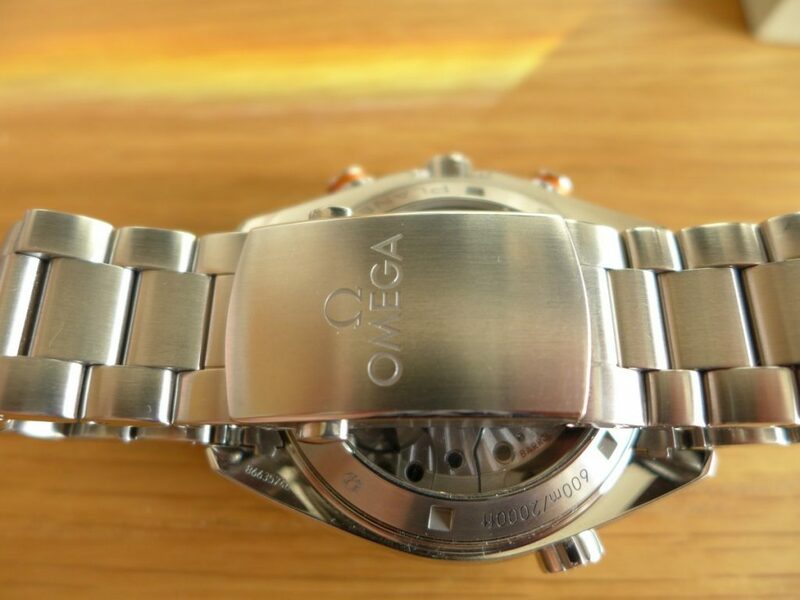 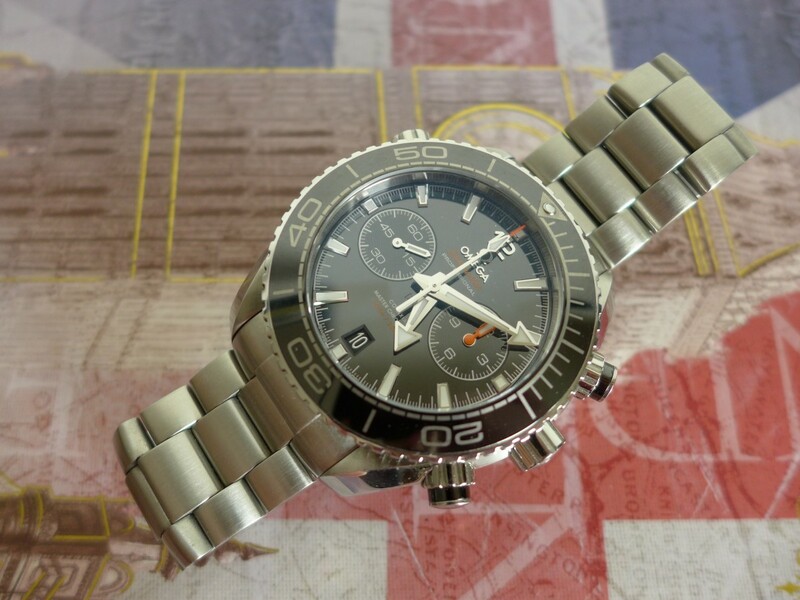 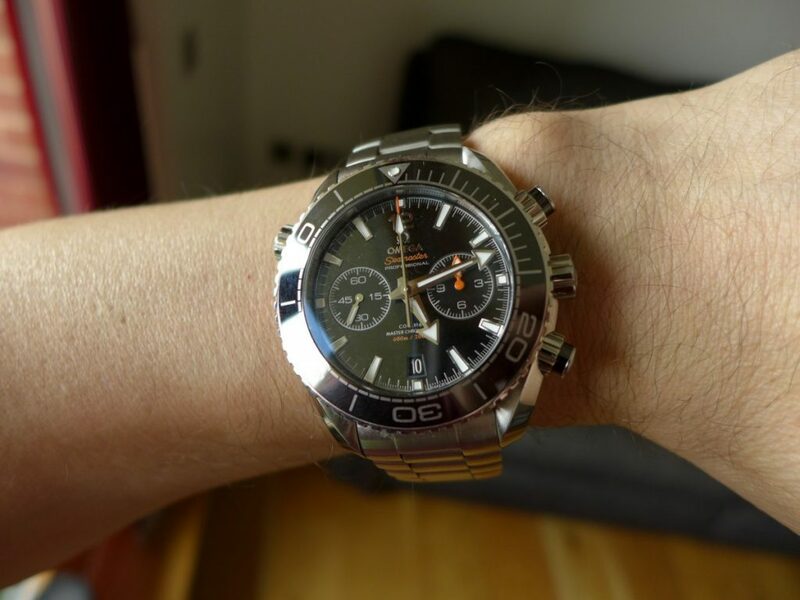 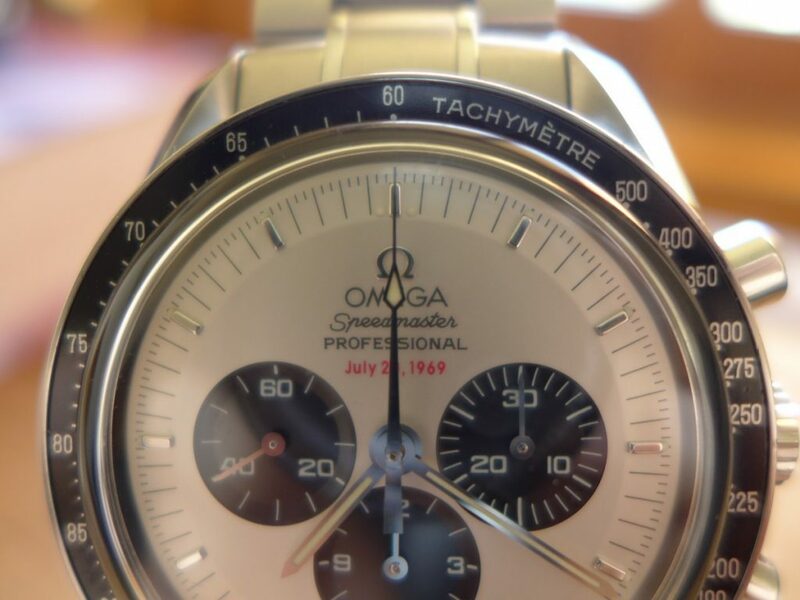 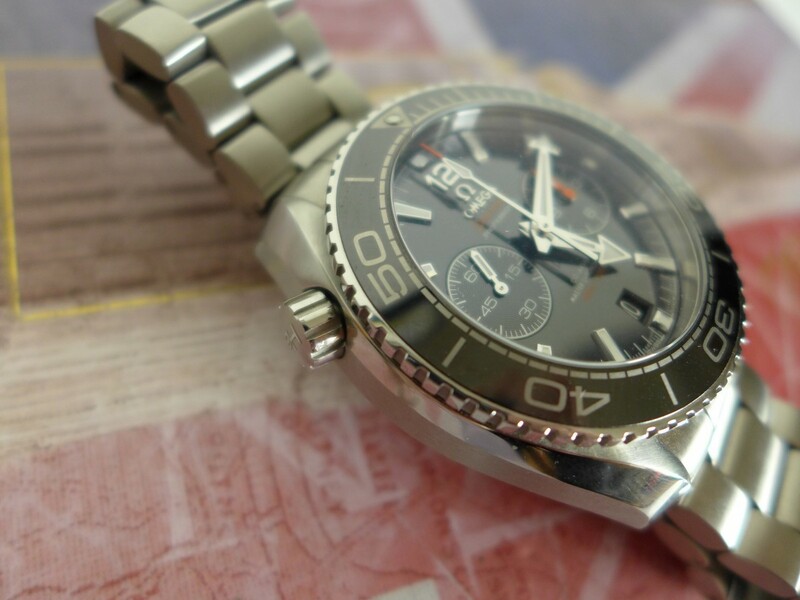 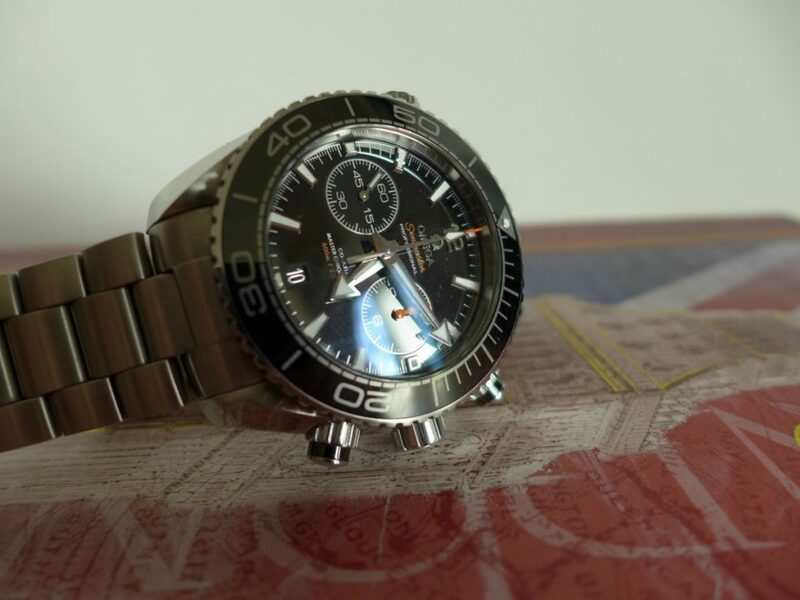 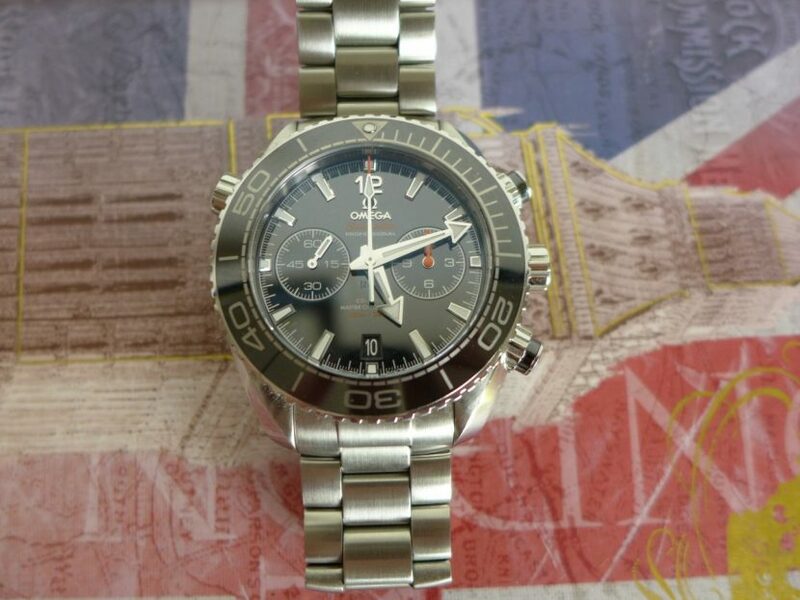 The Omega seamaster planet ocean chrono model number 232.30.46.51.01.002 is a nice big lump compared to the 42mm non chronograph, made in stainless steel brushed with subtle polished shoulders and pushers and rotating bezel. 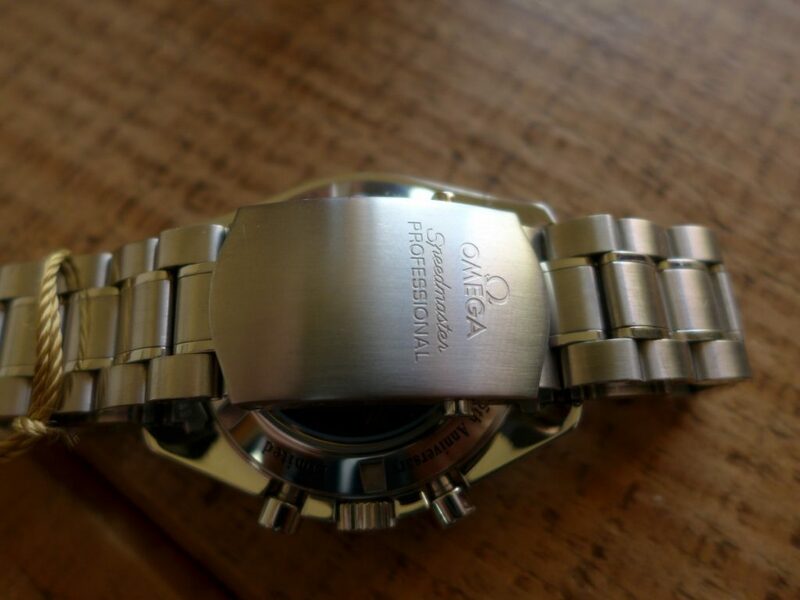 It houses the calibre 9300 co axial movement Omega’s bullet proof in-house chrono movement they use on a lot of their chrono watches. 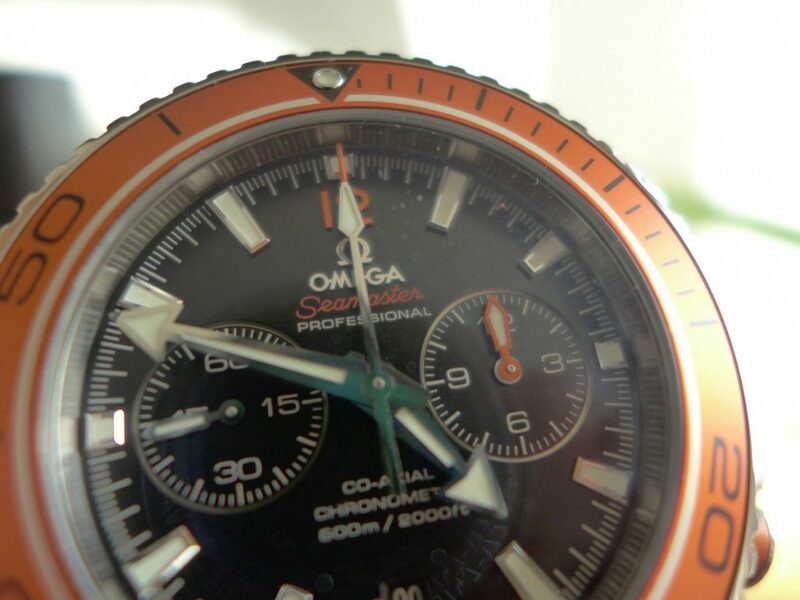 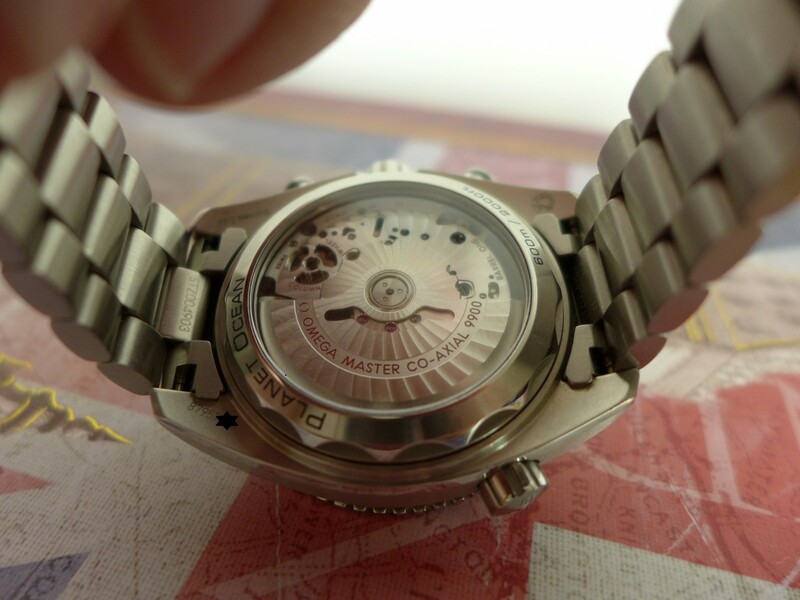 One of the big changes from the old chrono’s is 2 slit seconds sub dials instead of 3. 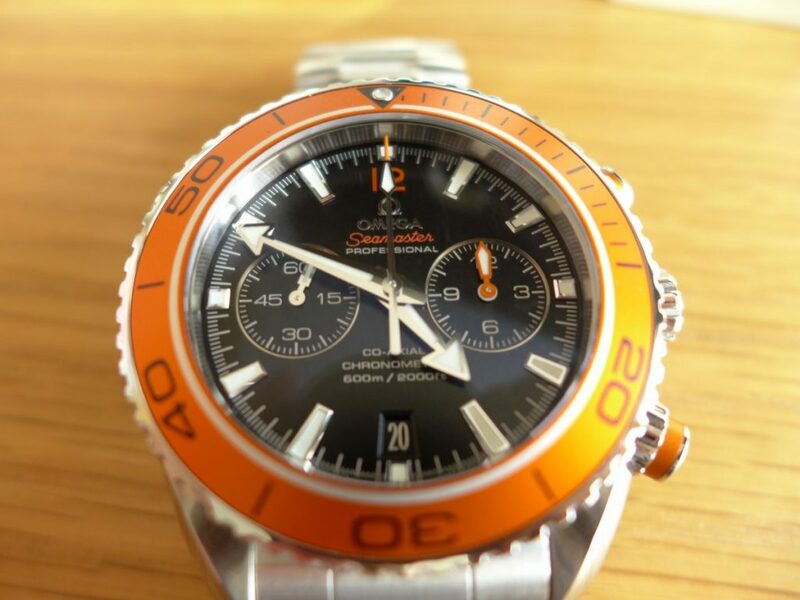 The watch is water resistant to 600m as the old one was but this wears very big on the wrist as is very thick indeed, date window at 6 o clock, a great combination with the orange bits on the pushers and little chrono hand plus number 12 on the dial. 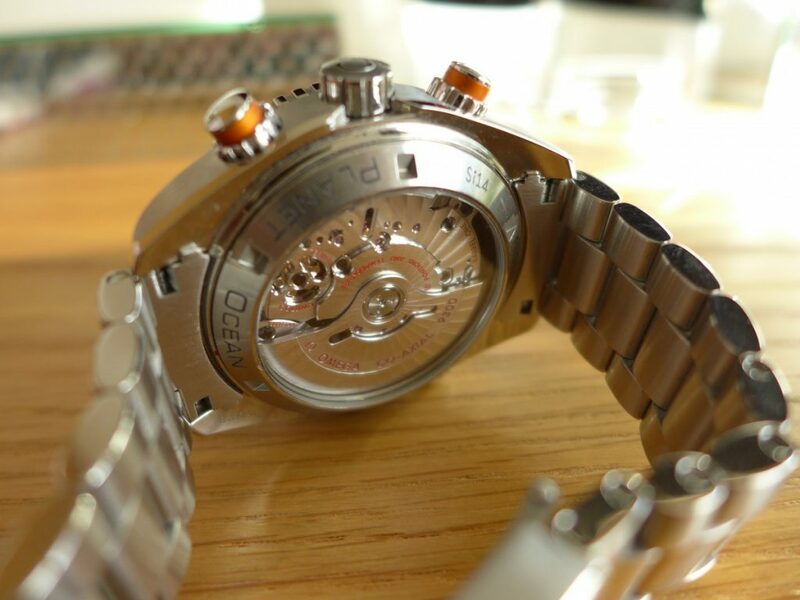 This model has see through caseback as well always nice to see the movement in my opinion although folk thinks it pointless on the wrist. 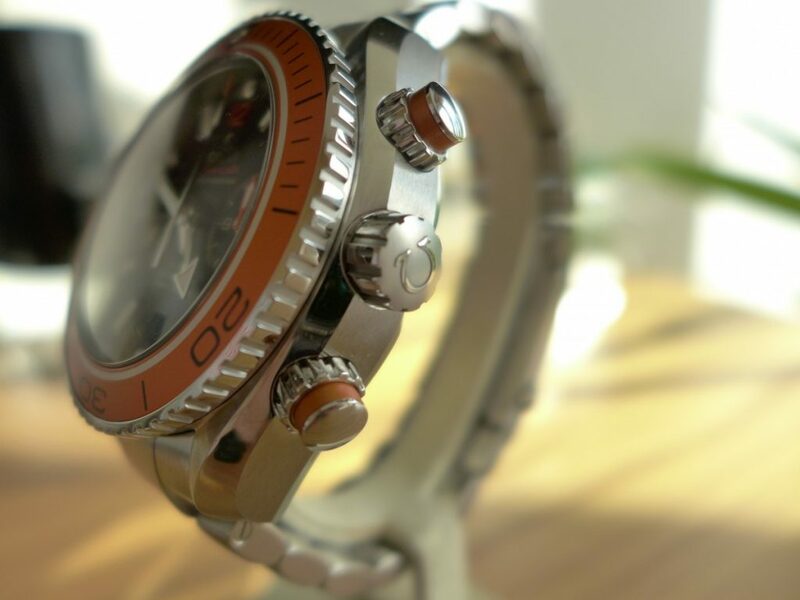 I do like the chrono version probably one of my favourite planet oceans all round, far better than the older versions also added bonus of a true diver’s tool like Rolex Submariners but big and beautiful.